In Fry Bread Nation, we explore Navajo food staples like mutton, blue corn mush and fry bread. Some are a source of strength while others carry hidden risks. Marlena Jones is sweating. She’s making fry bread for 40 people at a Cameron church function. She rolls up a ball of white flour, shortening and baking powder then claps it between her hands until it’s as big as her face. She then stretches it thin and lays it on a pan of bubbling grease. That pan sits over an open fire on a 90-degree day. "I used to make it every day because my kids love it," Jones said. "After I found out that I did have high blood pressure I cut down on the greasy stuff." Jones found out she was a candidate for Type II diabetes. "It is scary once you hear it that you have diabetes. But after I cut down everything came out to be normal," she said. "It was hard to get my blood to where it should be, my sugar level. It scares you because I have eight kids. And I try not to feed them all the greasy stuff." "Navajo people were basically given tin meat, lard, sugar, salt and flour. And that became the staple diet," said Manley Begay, a Navajo and a professor of Indigenous Studies at Northern Arizona University. 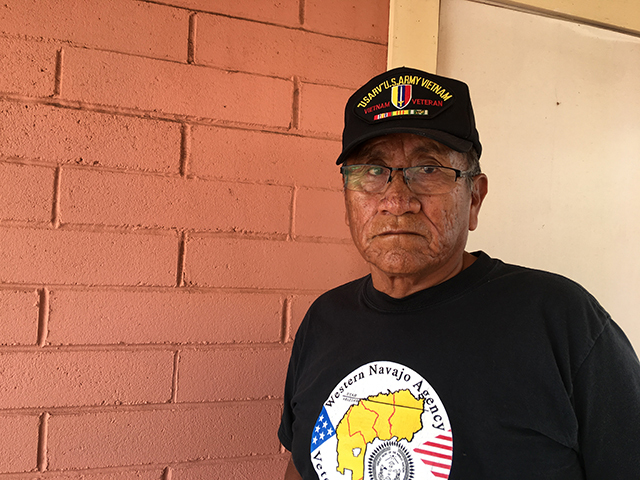 After four years of imprisonment, the federal government let the Navajos return home. But Begay said there wasn’t much to come home to. Their crops and animals had withered and died. So the government supplied the Navajo with rations of tin meat, lard, sugar, salt and flour. So fry bread remained a staple. "We have a complicated relationship with fry bread," Begay said. "It’s sort of a symbol of perseverance. We persevered from concentration camps to survival. Then it’s a source of pride, a symbol of pride at powwows and rodeos. People identify with fry bread as me, as native. Then also you have pain because of the high rates of diabetes." Fry bread isn't just a metaphor for an old problem. It remains a problem today. It still serves as a staple in Navajo homes. 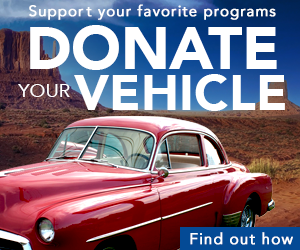 One in three Navajo people suffers from diabetes, according to the Indian Health Service. Obesity rates are three times the national average. The U.S. Department of Agriculture has labeled the entire Navajo Nation a food desert. Two years ago the tribe put a 2-percent tax on junk food and sodas and a 5-percent discount on fresh fruits and vegetables. Incidentally, the ingredients for fry bread aren't affected by the incentive. A common sight on the Navajo Nation, this stand is just south of Cameron. Still, many say they don't have the money to buy fresh foods and fry bread is cheap. "It's a tragic necessity when you don’t have much money. When there's high unemployment rate, and there's social ills, historical trauma issues to deal with. Often that's all you can eat," Begay said. Navajo chef Brian Yazzie says the solution is simple — Navajos need to return to their roots before the Long Walk. "We can look beyond fry bread. We can look beyond that and open their eyes to our ancestral food — squash, beans and corn," Yazzie said. Yazzie lives in Minnesota, but when he visits his family on the Navajo Nation he's always offered fry bread. "I came to terms where it's OK to deny it and say, 'Thank you but no,'" he said. Sometimes he gets flack for refusing. "Especially with the elders it's a term of disrespect." But he says it starts a conversation and that's where he hopes the change can begin. Sheep herding on the grounds of the Utah International Mine on the Navajo Reservation in May 1972. Three Northern Arizona University researchers set up a table outside a church event in Cameron. They were surveying people to find out how often they eat mutton. Andee Lister and other NAU students ask Cameron residents how often they eat mutton. For many it's a staple. Mining companies blasted 4 million tons of uranium out of Navajo land between 1944 and 1986. The federal government bought the ore to make atomic weapons. When the Cold War threat diminished in the 1980s, companies left and abandoned more than 500 mines. For centuries the Navajo herded sheep all across the rolling hills and mesas that make up the vast reservation. Over the last three decades, many of those sheep have grazed on abandoned uranium mines that are still toxic today. Inside the church kitchen, Marlena Jones and Rose Johnson made lunch. And guess what was on the menu — mutton stew — a big pot of squash, onions and cubed mutton in a bubbling broth. Johnson said the sheep came from her nephew’s land not far from the church. The women cut the purple flesh off the bone and put it into two pots. 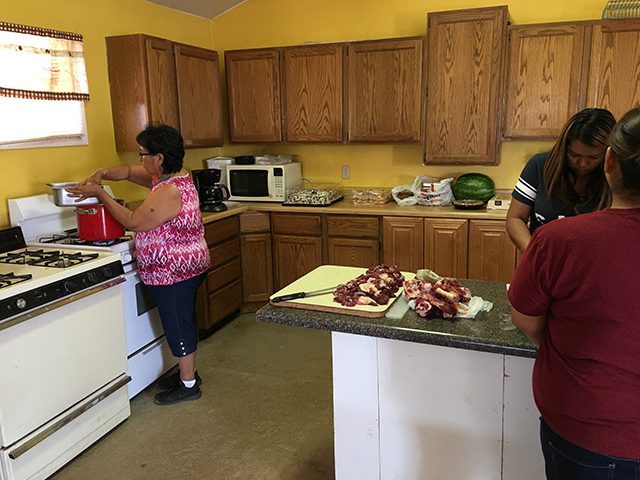 Like most Navajos, their mothers and grandmothers taught them how to butcher sheep. “There’s always a certain part of the bone where you cut it,” Jones said. Outside the kitchen, Nona Johnson said she’s worried about the uranium and said she usually buys her mutton from the Flagstaff grocery store an hour away. “Right now I’m concerned for the whole community,” Nona Johnson said. Johnson said she used to buy mutton from a nearby roadside stand. The couple who herded, butchered and sold their sheep there have both died from cancer. Nona worries their mutton was contaminated. The Centers for Disease Control and Prevention have linked uranium to kidney and respiratory failure. Lister is trying to find out if it’s the mutton that is killing people. “It’s kind of scary because you don’t know what you’re going to find and how people are going to be affected,” Lister said. NAU researchers have found uranium traces in the water and plants the sheep consumed. Lister and a group of graduate students have butchered six sheep from Cameron, six sheep from Leupp and another five from a control area off the reservation in the White Mountains. The students tested every part of the animal because nothing goes to waste among the Navajo. 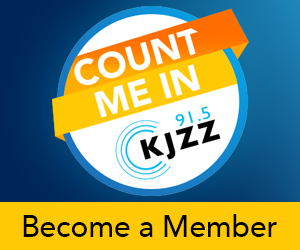 Jani Ingram is an analytical chemistry professor at NAU. She has overseen the group’s research. 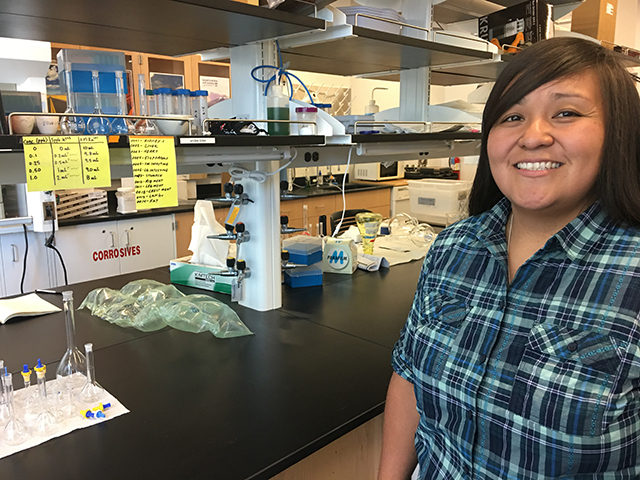 NAU analytical chemistry professor Jani Ingram and her students have been researching the amount of uranium in water, soil and plants on the Navajo Nation for several years. Community members asked them to test their sheep. Initial results show higher levels of uranium in the sheep on the Navajo Nation. Ingram, who is Navajo, said not only is mutton a staple part of the Navajo diet, it’s also used in ceremony. The group is finalizing their results. Then they’ll share what they find with the communities where the sheep grazed. They also plan to test more sheep on different parts of the Navajo Nation in the coming months. The Navajo burn branches of juniper and stir the ash into traditional food like blue corn mush. It has high levels of calcium. Navajo women are less likely to break their hips than white women, according to a study conducted on the reservation. Northern Arizona University graduate student Daniel Begay found this surprising because most American Indians are lactose intolerant. “They aren’t getting that same source of calcium from dairy products,” Begay said. Begay, who is Navajo, had always been told growing up that traditional foods were good for him. Turns out it was a traditional cooking method that was the key to his bone health. The Navajo burn juniper branches, collect the ash and stir it into traditional dishes. The most popular — blue corn mush. NAU graduate student Daniel Begay analyzed the amount of calcium in juniper from all over the reservation. He found that one gram of ash contained about as much calcium as a glass of milk. “The traditional foods they had been eating for so long, this is a really good source of calcium, especially for a Navajo person’s diet where they don’t get the same source of calcium other people would get,” Begay said. Begay tested this theory by analyzing the amount of calcium in 27 samples of juniper from all over the reservation. But first he had to ash the juniper outside his apartment in Flagstaff. Not quite the same as the rural reservation. His analytical chemistry professor Jani Ingram said he did most of the work in the lab. “You have to get it to the point where you can dissolve it in acid and then dilute it down and then do the analysis that way,” Ingram said. It was there Begay found the calcium level was fairly high. “For every gram of ash that I was able to sample, I was getting roughly 280-300 milligrams of calcium,” Begay said. That’s about the same as a glass of milk. But he said the body seems to absorb the calcium from the juniper ash easier. I decided to see for myself. 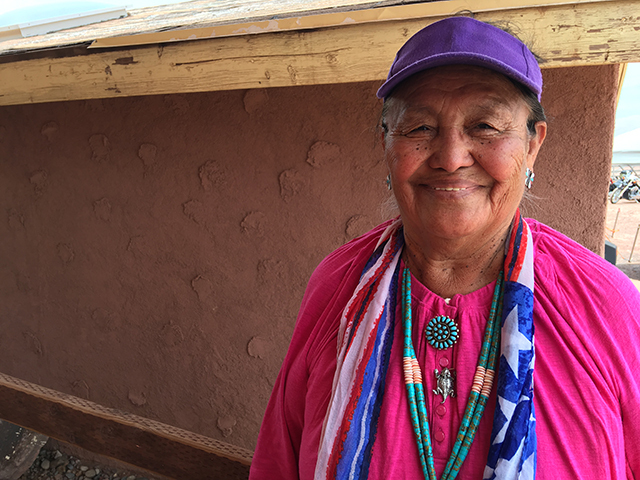 So I drove to the tiny community of Jeddito in the middle of the Navajo Nation to Lillie Pete’s home. Pete teaches classes on how to cook traditional Navajo food. First she showed me where she picks the juniper from behind her house. “Some of them will be all brown, you can see it has brown spots on it,” Pete said, holding a juniper branch. It was too windy to burn the ash on this day. Fortunately, Pete had a large jar of juniper ash ready to go. So we got to making blue corn mush in her kitchen. Pete said she already knew juniper ash was good for her along with many other traditional Navajo foods. Lillie Pete sifts the juniper ash before adding it to her blue corn mush. Pete teaches young and old how to cook traditional food. She said many Navajos tell her they forgot the traditional ways when they were forced to go away to government-run boarding schools. Now with the known health benefits, there’s even more incentive to learn. Pete boiled water. Then she poured it onto the ash. Then she measured the cornmeal and stirred with several long sticks tied together. She said she always stirs in a clockwise direction to keep her mind calm. After several minutes the corn mush produced thick volcanic bubbles, which told us it’s ready. Pete gave thanks to mother earth for the corn as she cleaned each stick. Then we sat down to a hot bowl of delicious blue corn mush.